The remains of a Cuvier's beaked whale which was washed ashore during military manoeuvres is the latest skeleton to be exhibited along Fuerteventura’s coastline. 12.10.2015 - The move comes as part of a 15-year initiative which started shortly after the turn of the millennium when Fuerteventura Council began a project to draw attention to the threats to the oceans and their inhabitants, and our responsibility to protect them. The scheme includes the permanent display on coastal paths of several rather impressive skeletons of stranded whales. The most recent of these is one of a number of Cuvier's beaked whales which were found beached at Majanicho 11 years ago. The cetaceans’ death was associated with a military naval exercise, named ‘Majestic Eagle 2004’, which evidently caused three Cuvier’s to be washed ashore in July of that year: two in Fuerteventura and one in Lanzarote. 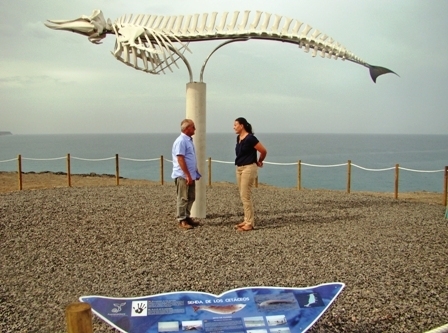 The latest to put on display, during September at El Cotillo in La Oliva, was the 5.75 metre long adult female which was found on July 24, 2004. The Cuvier's beaked whale does not generally live near the coast. This species is the record holder among all mammals for its long deep sea diving capabilities as it is able to dive to a depth of about three kilometres, with a possible dive time of over two hours without surfacing for a breath. During an evaluation of 1,000 dives, on average, the Cuvier’s beaked whale went to a depth of around 1,400 metres and remained under water for well over an hour. Encounters with these giants on the open seas are rare as they are very evasive, so little is understood about them, but it is known that they typically feed on squid and crustaceans which they catch in deep waters. Their gender can only be determined by the two teeth that males have protruding from their lower jaw, which females do possess but which rarely protrude above the gum line. But for all their elusiveness, dead Cuvier’s beaked whales often wash up on shores around the world. For all whale and dolphin strandings in the Canary Islands the bodies are examined to determine the cause of their demise and, following the deaths of a large amount of the creatures being irrevocably linked to military manoeuvres, the practice was eventually banned in Canarian waters. The latest Cuvier’s beaked whale to be installed on the coast, the preparation of which was co-financed by the Canarian government and the European Fisheries Fund, comes hot on the heels of another of its kind which has been displayed on the Avenida Marítima in Gran Tarajal since March of this year. The very first skeleton to be installed in the project was that of a 19.5 metre long fin whale, which was placed at Las Salinas del Carmen since 2003. The carcass of the animal was found three years earlier, stranded on April 18, 2000, on the coast of Majanicho. This was followed by the skeleton of a 15 metre long sperm whale in Jandía in 2006 and that of a 10m Bryde’s whale at Playa de Los Pozos in Puerto del Rosario in 2013. Before that, portions of these and other skeletons were presented as a travelling exhibition at the visitors’ centre in Jandía, the Lobos Natural Park, the Juan Ismael art centre, and in 2011 as part of an exhibition on the Fuerteventura biosphere in Madrid’s Royal Botanical Garden. In addition to the tourist attraction that the remains of these imposing marine mammals represent, the main focus is on making visitors aware of the wealth that is hidden in the Canarian waters, and on encouraging them to help with the protection of this unique habitat. Produced with news.CMS in 0,0704 seconds.